Pink tourmaline is the modern birthstone for October. It is a beautiful rosy pink faceted gemstone. 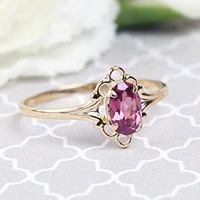 Our 14kt gold October birthstone ring has a beautifully faceted pink tourmaline. Tourmaline is a complex silicate that contains boron. The stone has a larger color range than any other gemstone - it is available in every color! The Mohs hardness for tourmaline is 7 -7.5, so it is a fairly hard stone. Pink tourmaline is said to be a stone of the heart; it is soothing and gives feelings of comfort. 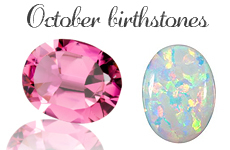 White opal is the traditional birthstone for October. Opals are a hydrated amorphous form of silica. White opals have a pale white body tone and display many beautiful flashing colors. Most white opals are from Australia and come from the Coober Pedy mines. The Mohs hardness for opals is 5.5 -6; so they are moderately soft stones. 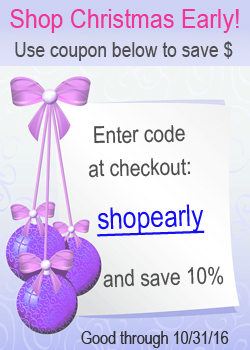 Take special care of your jewelry containing opals. 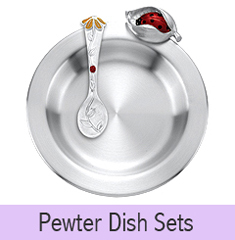 For jewelry, most opals are cut and polished as smooth, domed cabochons; they are not faceted. The Gingham Grasshopper offers a large selection of birthstone rings, earrings, and necklaces for children, teens, and adults. Our baby earrings come in the popular screw back style and are available in sterling silver or 14kt white and yellow gold. 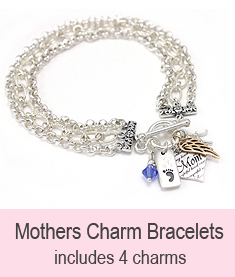 We also offer baby and children's bracelets with genuine birthstones. 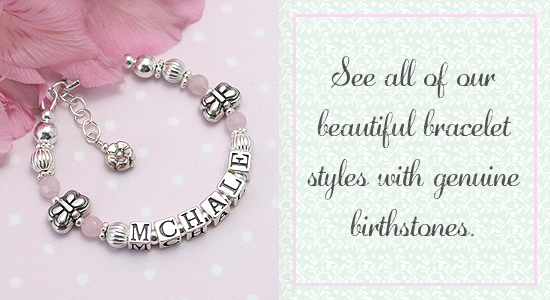 Our selection includes gorgeous engraved bracelets in cultured pearls, plus baby name bracelets with birthstones. Discover the perfect birthstone jewelry for your birthday girl in our wide selection of bracelets, rings, earrings, and necklaces.